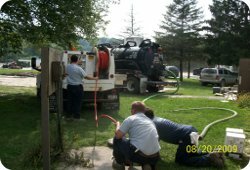 The Environmental Products & Services Vermont, Inc (EPS) Grease Trap Maintenance Program is managed through a scheduled pumping and cleaning plan to ensure efficient, effective system operation. EPS technicians will clean the system as scheduled and dispose of all waste in an environmentally compliant manner at a fully licensed and permitted facility. 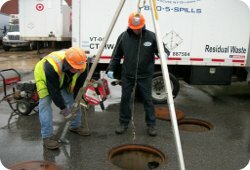 An effective and efficient Grease Trap Maintenance Program should encompass more than just pumping the trap; it should also include drain line management. Our program is a grease trap and drain line maintenance program specifically designed to clear drain lines of organic buildup through high-pressure water jetting in conjunction with regular grease trap evacuation. 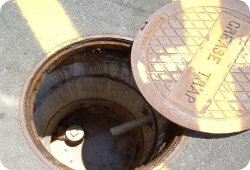 EPS also offers competitively priced grit, sand and lint trap maintenance services for car and truck washdown areas, laundromats, storm drains, lift stations and other non-hazardous waste collection traps. Contact us for more information.